Create a hip kids bedroom decor for under $600 by taking advantage of our SouthShore Furniture sale. If you add the following four pieces of SouthShore kids furniture to your child’s bedroom all visitors will experience Shock and Awe when you tell them how little you paid. Better yet, you’ll have some extra cash in your pocket to get something nice for yourself. First and most important kids furniture item is the SouthShore Step One Twin Platform Bed in White. This is a contemporary, crisp looking kids bed that will go beautifully with any room decor. 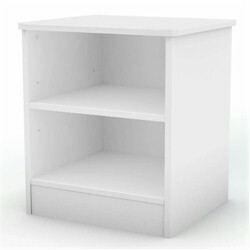 It has clean lines and the White color allows it to match with any other white furniture choices. Lucky for you, SouthShore happens to offer the perfect add-on kids bedroom furniture to go with this contemporary kids bed. See the rest below. Next to the bed you’ll want to put the SouthShore Step One Nightstand in Pure White, so your child has a place for all her bedtime essentials. This nightstand has open shelves where your child can keep favorite books, stuffed animals and other things that make bedtime more enjoyable. The top has plenty of room for a lamp, alarm clock and glass of water. The pure white finish goes perfectly with the previously mentioned platform bed. You’ll also want to add some storage to your child’s bedroom and that’s where the SouthShore Logik 4 Drawer Chest in White comes into play. 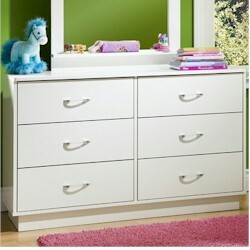 This is one gorgeous piece of kids furniture with a bold design and four large drawers for keeping kid things in order. This chest’s modern style goes beautifully with the other SouthShore Furniture I’ve already mentioned. 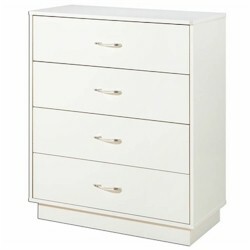 Last in this cheap, yet stylish and durable kids bedroom furniture combo is the SouthShore Logik 6 Drawer Dresser in White. It goes beautifully with all the other furnishings, thanks to its contemporary design. It’s also made with 6 deep drawers for optimal storage space for kids clothes and other accessories. If you like the SouthShore Furniture you’ve seen here then I’d recommend checking out all the SouthShore Furniture collections because there are several items on sale right now!